Alocasia X 'Calodora' = A. gageana 'California' X A. odora - Perennial - This popular Larry Garner hybrid is also called 'Persian Palm'. 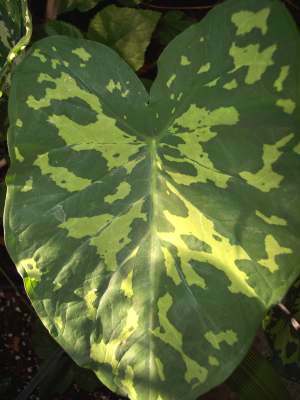 Boldly variegated foliage distinguishes this compact "Elephant's Ear" selection. The petioles (leaf stalks) are quite dark and the whole plant is usually less than 3.5 feet tall. It does best with a 6" deep mulch to conserve soil moisture and to protect the corms from harsh winter temperatures. Grows best in half-day sun (morning) or dappled light all day. Looks best if given a deep watering every week during a dry summer; in fact, it grows very well in a bog garden. Like its relatives, it is a "gross feeder", meaning it thrives with frequent doses of a high-nitrogen fertilizer. 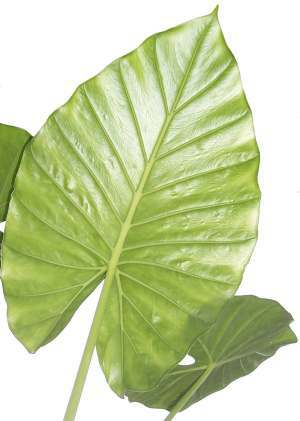 An enormous "Elephant's Ear" with upright, shield-like leaves and a substantial above-ground stem which can grow to over 3 feet tall in protected sites. Eventually, it will form a large clump with many such "trunks" each topped with a crown of huge leaves. As with all Elephant's Ears, the largest plants result from frequent fertilization from mid-March to late-August. Does best with a 6" deep mulch to conserve soil moisture and protect the corms from harsh winter temperatures. Grows in full sun to half-day sun. Looks best if given a deep, flooding watering every week during a dry summer. Colocasia esculenta 'Fontanesia' - Also known as C. esculenta var. fontanesii - Black Stem Taro, Burgundy Stem Taro, Red Stem Taro, Violet-Stemmed Taro etc. - Perennial - A very attractive and totally cold-hardy (Zone 7) perennial cultivar of the common Elephant's Ear. The leaf-stalk (petiole) is black, burgundy, red or violet. The major veins on the leaf are usually colored like the petiole. It performs best with morning sun and afternoon shade. Plant with compost and other materials which enhance the soil's water-holding capacity. Colocasia esculenta 'Nancy' - 'Nancy' Taro - Also sold as: 'Nancyana', 'Nancy's Revenge', etc. - Perennial - Introduced at the 2000 International Aroid Society meeting. It was discovered by Gerry Krantz and named for Nancy McDaniels. Colocasia esculenta var. antiquorum 'Illustris' - Imperial Taro - Perennial - A selection from Banta Nurseries of a Himalayan plant.